When baby is in mother's tummy and mummy eats food, will the food fall on the baby? 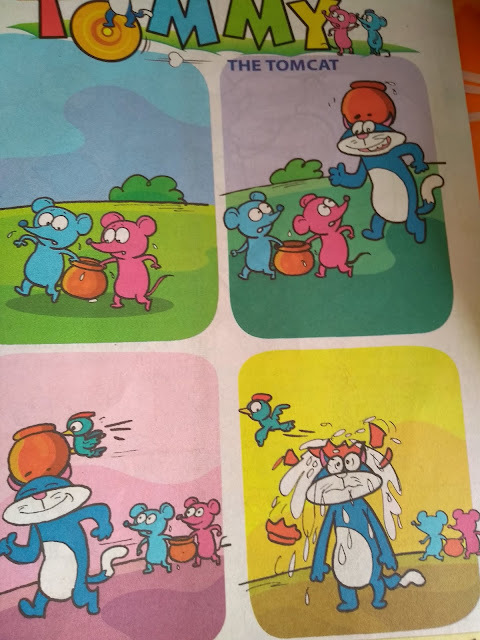 Why are the head hands legs sticking to the body, what if they didn't stick? Originally, who sticks all these parts to the body of a human? Who creates a human?? When it is raining, will the construction workers keep working in rain to build a building? How can a building be built with sand ? All these asked in a span of 10 minutes. Hanuman carrying mountain on a hand and holding gada with another. During one of her conversations with her cousin(I can't recall the context), both of them exchanged some number terms saying, one, five, ten, hundred, thousand, million and it stopped there. DD1 recalled it some days later and asked me how many zeroes are present in a million. 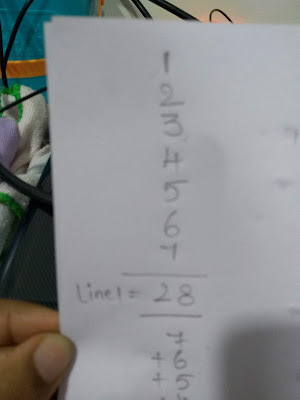 I usually do not answer right away for any of her question, I started writing 1 followed by zeroes starting with 1 zero, then 2 etc...We read through some maths to see the terms of those big numbers where 1 is followed by 24 zeroes or 27 zeroes...She intently read through that passage (it was on quora) where some numbers were mentioned along with the terms. She asked me how some would read out and we explored together. So, did all that she read just go out of her thoughts? NO! 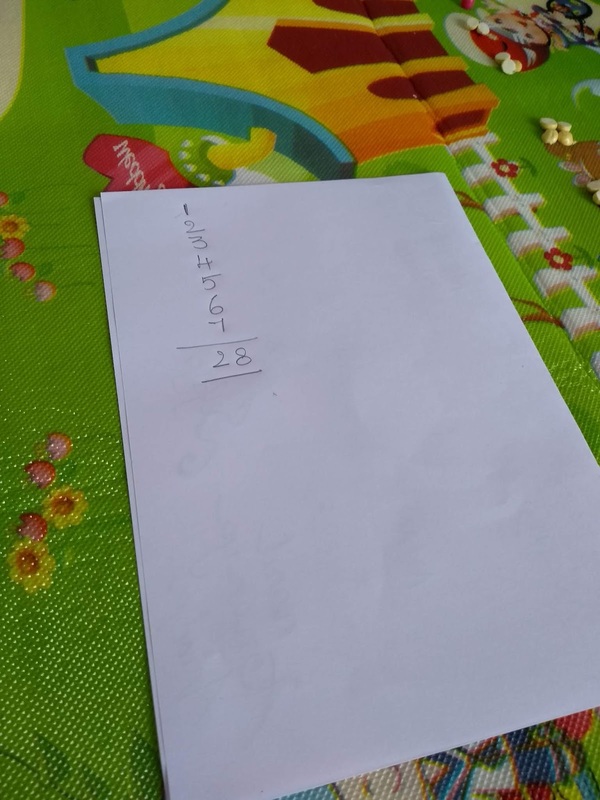 End of the day, during her dinner, she was recalling those number names and asked me which number had 24 zeroes. We came back to our board and explored more. That's how learning is when it is lead by a child. What creation even while having curd rice!!! She gets ideas out of nowhere. She weaves stories out of thin air. Her world is always filled with imagination and play. In the video here, DD1 is seen making keyboard on tha plate and playing music from it. DD1 pretend plays with brick as ipad. Swipes across asking what story DD2 wants. DD2 responds with her amusing sounds. DD1 plays the story on the pretend ipad. DD2 replies again with her amusing sounds. DD1 interprets her sounds and narrates the story. If this is not creativity by a 1.5 yo and 4.5 yo, then what is? Is colouring with exactly the mentioned colours and in between the lines as shown in the copy colour book more creative? I do not think so ! This play lasted for whole 30 min. DD1 tries to read out names from WhatsApp. She asks how does ***tya pronounce? Then, we figured out similarity among names ending with -ya. Next, we make combinations of an alphabet with the sound -ya. DD1 says, I write. DD1 too writes for sometime. She starts prep-ending two alphabets to -ya. Ends up writing PRYA and repeats its sound. Giggles for a while. Recalls the name 'Priya'. 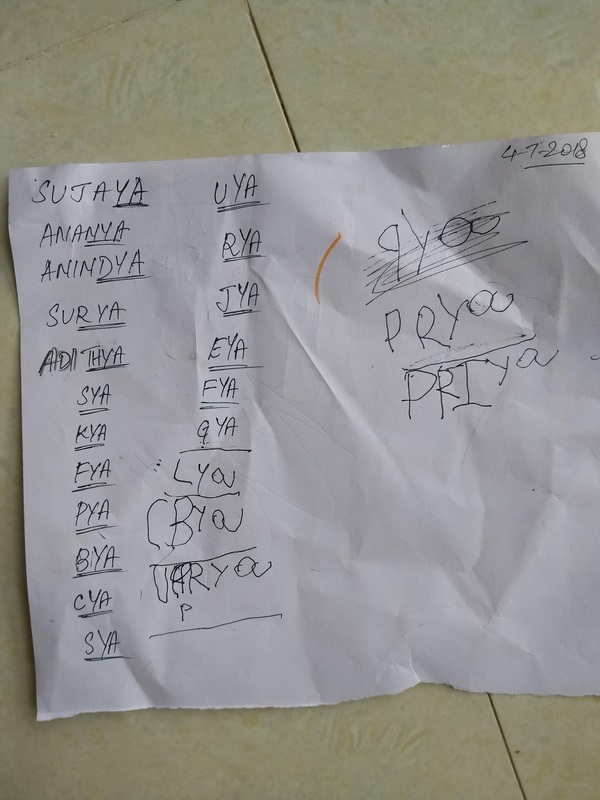 We discuss how PRIYA and PRYA sound differently and notice the only missing element 'I'. She then writes PRIYA pronouncing as it is. I think, more than teaching/learning meaningful words, their pronunciation, their meanings, the child's ability to make use of alphabets and create new sounds is a better choice. From story to couting to eating! Children do not need any formal activity - making them sit, asking them to arrange, asking them to count. When they see that people around them use numbers to count objects or make some calculations (say, while paying bill), they somehow get the same in mind even while playing. I can't say more!! 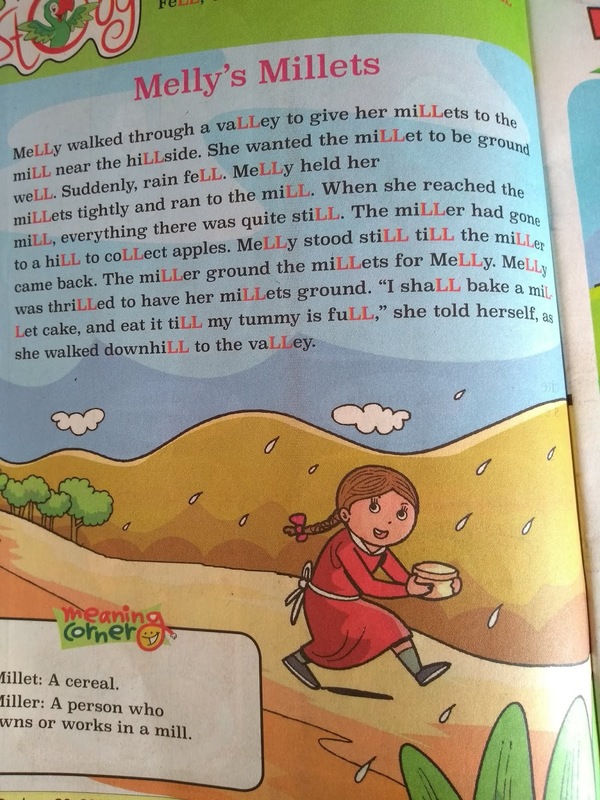 DD1 started with asking me to read out this story where a girls was carrying millet. 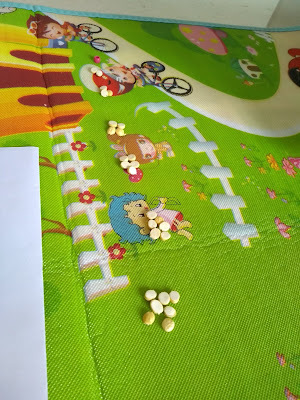 DD1: What does a millet mean? I gave her some examples that led me talking about types of dal. 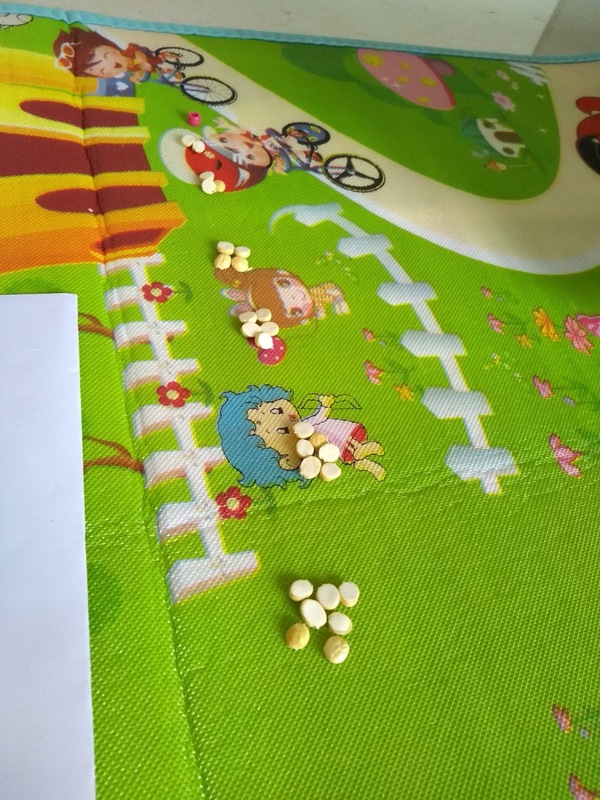 She immediately recalled the putnala pappu (roasted yellow channa dal) that she used for playing and eating too the other day. Went running downstairs to the kitchen, got them up. Again, asked me to count them. She noticed that adding 1 to 7 forwards and backwards give the same result. Then, she asked me to count the total dal. I did it both ways - by pointing physically and adding on paper. 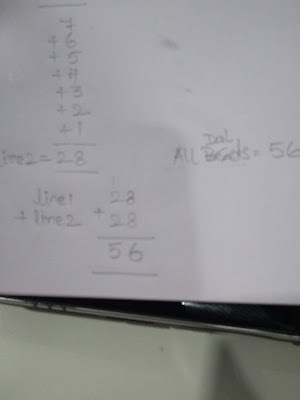 After all this, she happily ate away the dal, not just blindly, but mathematically, haha !! She spent close to 15 mins by slowly counting again, making groups, eating 2 at a time, eating 3 next time or 6 the other time and so!! It is interesting to look at a picture story without text along with a child. It is not the same as the one that we read, but the child who infers from the pictures. It is interesting to note the keen observations that child makes from the pictures.